Volkswagen's successful Golf GTI TCR racer made its U.S, debut at Daytona as the TCR series moves to the endurance circuit. The debut was at Daytona. 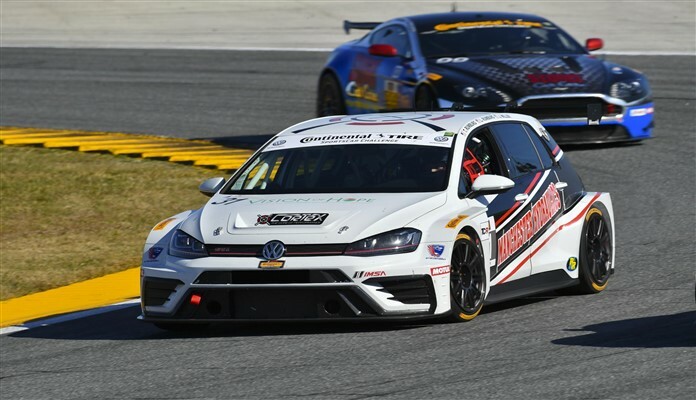 After two successful years racing across Europe, the Volkswagen GTI TCRmade its racing debut in the U.S. at the Daytona Motor Speedway as part of the BMW Endurance Challenge, part of the IMSA Continental Sports Car Challenge series. The No. 31 Rumcastle Racing GTI TCR, driven by the trio of Tanner Rumburg, Luke Rumburg, and Jon Miller, in the Touring Car Racing (TCR) class. VW introduced the GTI TCR three seasons ago. Since its introduction, it has grown to include 20 national and regional race series worldwide. Last year, the GTI TCR was one of the most successful touring cars in the world. For example, the GTI TCR won “Model of the Year” honors in the TCR International series. And, it helped driver Jean-Karl Vernay, earn a driver’s championship. Also, a VW GTI TCR took its class at the VLN Endurance Championship on the Nurburgring’s famed Nordschleife. The GTI TCR is a turn-key solution for racing teams that want factory-built quality and reliability in a package designed for performance and ease of use. About 65 percent of the parts are carried over from the production version, including the engine components. Visually, the Golf GTI TCR gains its aggressive look through 18-inch racing rims and a version of the award-winning MQB chassis that is about 0.6 inches wider than that of the production Golf. An adjustable aluminum-alloy rear wing -- standard for all TCR cars -- generates additional downforce. The car’s safety features include a racing seat with head protection, a racing roll cage, and an FIA-approved safety fuel tank. The class rules specify four- or five-door vehicles with engines limited to 2.0 liters and 350 horsepower driving the front wheels through a six-speed sequential transmission.